There are a number of options available to the restorer for the removal of paint and rust. Broadly, these are divided into two main categories, chemical and physical. Before we go any further, you need to consider a few things. Are you going to do this yourself or pay for a service? What is the condition of the surface you want to strip? Do you want to deal with chemicals or physical methods? Each of the answers to these questions lead you down a decision path and you must consider each question carefully. These are by no means the only considerations, but they will get your mind ticking! Obviously, the easiest method is to pay someone to strip the surfaces for you, be they steel painted panels, or timberwork. But you shouldn't stop thinking here. If you are going to pay someone, then they will be charging you for their time and consumables. The more laborious methods obviously take more time and therefore have higher labor costs, where some quicker methods involve costs associated with expensive chemicals or specialised equipment. If you'd like to do the stripping yourself, then you need to consider the environmental aspects of all methods. By environmental, I mean, Can you deal with the dust of sanding or blasting, the chemicals of stripping preparations? Are there local laws to consider? Also, do you have time? What about rust? Just because you may not be able to see it, doesn't mean its not there. If you have extensive rust, there are some methods that actually convert rust and preserve it as part of the panel. Whether it's appropriate to have it converted and preserved largely depends on the actual panel in question, how much of the original panel is left and what alternatives are available for replacement or repair. So lets look at the various options. This is not meant to be an instruction guide, but a general explanantion of whats available. Physical methods are basically any method that requires some form of abrasion to remove the paint and or rust. Sanding with various grades of papers and stripping pads. Wire brushing, either by hand or power tool. Blasting. Sanding is probably the most time consuming and labour intensive of all the methods. The benefits are that just about anybody can do it, the supplies needed are relatively cheap, widely available and fairly safe. (although breathing masks should be worn) Sanding also enables you to carefully remove layers one after the other, depending on the grit rating of the sanding paper or pad you use and the amount of effort applied. So if you need to take the "softly, softly" approach, sanding is probably the best way to go. Grit rating refers to the level of courseness of the sanding material you are using. The more course the material, the more paint surface removed, quicker. However, quicker is not always better, as the surface left after a course sand is quite rough, and more sanding with finer papers is required to return the surface to a suitable condition for repainting. The grit rating refers to the actual size of the abrasive particles. There are two general rating systems used, but for our purposes, the grits range from 24 or 12 (depending on the rating system used) through to 2400 or 1200. The lower the number, the larger the particle size and the more course the material is. 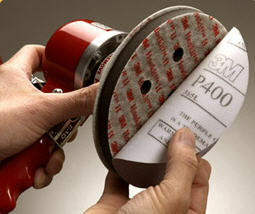 Another popular material used for sanding is a range of products from companies such as the 3M company. These include attachments that can be readily fitted to power tools to make lighter work of stripping paint that are manufactured from a range of artificial materials that generally have a longer sanding life than the average sheet of sand paper. Wire brushing is another method of removing paint and rust. Wire brushing is generally done by either hand or power tools with an appopriately contructed brush. CAUTION: Wire brushing can be very aggressive, rapidly removing layers of paint, rust and any material softer than the brush. It is imperative that appropriate safety gear be worn, especially eye protection as some brushes are not well constructed and can release some of the small lengths of wire that make up the brush. Always check the manufacturers instructions for use as most are restricted to a safe maximum speed of revolution. 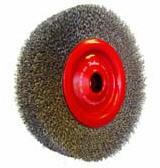 This is an example of a commonly available brush for use in power tools. Blasting refers to a number of methods that "fire" a stream of abrasive material at high speed and volume at the surface to be stripped. Blasting methods include the use of abrasives such as sand, plastic bead, garnet, walnut shell and soda. Each of these make use of the same principles, but have varying results and risks. Blasting is generally quick and effective but can be very messy and is best utilized in dedicated areas (blasting booths). The use of sand has generated a lot of discussion over recent years, due to the risk of silica poisoning. Silica is released from the sand during the process and is highly toxic to humans. In the appropriate circumstances, sand blasting can still be effectively used, but is not recommended for use on steel panels as it can result in warping of the steel, not from the collision of the sand on the steel, but rather from the heat that is caused by the friction of the same. Bead blasting was initially used in the Aero industry and has the benefit of being more gentle on the surface it is stripping and at the same time, coating the surface it has stripped, protecting it to some degree from oxidation. Blasting with other abrasives such as ground walnut shells has been found to be far safer than sand and to some degree, environmentally friendly as it reuses a waste product from the Walnut industry. A more recent development in the blasting industry is Soda blasting. The same basic principles are applied in that a media is "fired" in a stream at the surface to be stripped, but in this instance Bicarbonate of Soda is used. The two main methods for chemical stripping are either the application of a stripping chemical to the surface to be stripped, or, the imersion of the item to be stripped into a solution. Obviously, the quicker of the two is the total imersion of a vehicle in a commercial stripping bath. Here the entire vehicle is dipped into a stripping solution and as such the car must be disassembled to leave only the chassis and panels. There is a wide variety of paint stripping chemicals available to the DIY enthusiast. The most common solvent mixtures usually contain dichloromethane, but there are many others and their mixes depend on the application of the product and the paint it is designe to remove. The main process is to apply either the liquid or gel form (gels are better suited to vertical surfaces as they cling better. The chemical solution penetrates the paint surface and cause the paint molecules to swell. This swelling in conjuction with the weakening of the adhesive qualities of the paint, result in it lifting off the surface. This is basically relying on a simple chemical reaction. The mixing of molasses and water, that is left to ferment for a few weeks, produces a mixture that ends up containing Acetic Acid. Mix 7 litres of water with 2 litres of molasses and seal it in a container to prevent evaporation. You will need to store this somwhere downwind as it becomes a little on the smelly side. Once ready, the skin is removed from the surface and the rusty item needs to be immersed completely and left, undisturbed for a few weeks, so overall, this is a SLOW process. The beauty of it though is that it only removes the rust, not the paint, so good for partial stripping. Basically what happens is the acetic acid reacts with the oxygen in the rust and when the iron oxide (rust) is all reduced the process stops, leaving the clean steel untouched. HOWEVER, you must clean the steel thoroughly and then treat it with a sealant of some sort, either a proprietory rust inhibitor or oil to prevent the oxygen in the air attacking the surface and causing rust again. This can occur in a matter of minutes, so you must do it straight away. This process will get all rust, not matter how hard, extensive or inaccessible to other methods, but it is time consuming and smelly.